The “01301: Art by, for, and about Greenfield” show is coming down the pike! Thirty local artists will be in the show and the opening will be during the weekend of the Brick + Mortar International Video Art Festival, October 12-13. Mark your calendars! “01301” during Brick + Mortar! Juror Jean-Pierre Pasche was not able to participate but jurors Jenn Simms, Braden Chattman, and Becky George have viewed all of the entries; they will be deciding the final winners in the week prior to the opening reception. If your piece was chosen for the show, you will be receiving notification soon. Thanks again to all who entered! The “01301” opening reception will be held sometime Friday or Saturday, October 12 or 13, the same weekend as the Brick + Mortar International Video Art Festival here in Greenfield. We have leads on several good downtown locations for the show & will be choosing a final location sometime in September. We look forward to announcing the details soon! More Brick + Mortar’s award, including our very own chair Becky George on TV! Brick + Mortar wins MCC’s Gold Star Award! 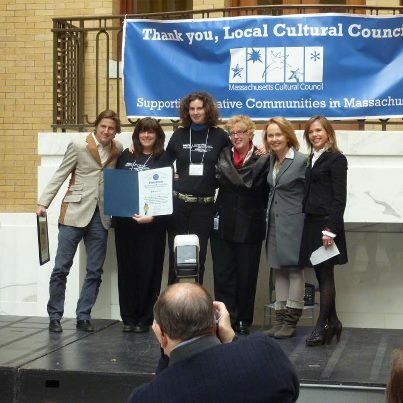 Bradley McCallum, GLCC Chair Becky George, & Kate Snyder accept the MCC’s Gold Star Award for the Brick + Mortar International Video Art Festival from Rep. Denise Andrews, actor Kate Burton, and MCC Executive Director Anita Walker at the State House in Boston. Way to go!